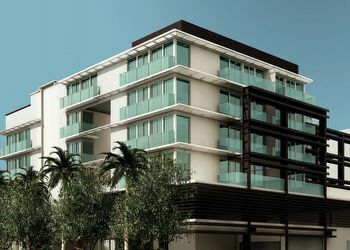 The 1215 on West Avenue in Miami Beach by the Domus Group and architect Robert E. Chisholm of Chisholm Architects is a six story building located near the western edge of the city in the South Beach area. It consists entirely of 45 Miami Beach condos for sale with one bedroom and bathroom boasting several modern features including private balconies. Because the 1215 on West Avenue condo is a mixed use building, it not only functions as a residential condominium but also has a restaurant capable of accommodating up to 72 people on the ground level with seating indoors and out. Additional features include a swimming pool and sundeck on the rooftop and the flexibility of a vacation rental program. The smallest units of 1215 West Avenue condo have 440 square feet or you can choose the larger “Unit F” which has 520 square feet. You'll find floating vanities, nine foot ceilings, keyless entry systems and floor to ceiling windows as some of the residential features. The residences come move-in ready with their own furnishings. Choosing the 1215 on West Avenue condominium means you'll be close to the many sights and sounds of the popular South Beach area. You can spend some time in Flamingo Park, hang out at the Fontainebleau, explore Ocean Drive, have a drink at Nikki Beach Club, enjoy a meal at Joe's Stone Crab or simply sunbathe on the beach itself less than fifteen minutes east of the building.